I have read that the electric energy flows from the battery into the circuit through electric field created outside the wires into the light bulb (or any other resistor). I have also read that the friction caused in the movement of electrons cause light bulb to heat up. So which is the correct explanation? The electric field that is applied to the wire (it doesn't matter if you consider it to be outside or inside the wire for the purpose of this explanation) causes the electrons that are indeed inside the wire to move. This movement involves the "friction" you heard of ( electrical resistance), which in turn causes heat (and emission of photons). The important thing is that it is not the field that's flowing. The field causes a flow and that flow causes the heat. 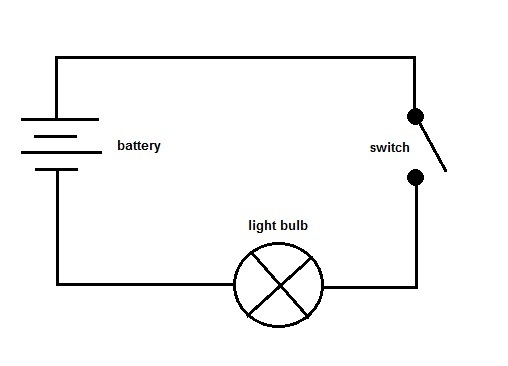 This is a simple circuit with a battery a switch and a light bulb. The battery has the energy in chemical form, i.e. there are atoms and molecules separated into ions that generate a voltage drop, (an electric field ) accross the switch. No current flows as long as the switch is open, and no energy is transfered. Once the switch is closed a current develops in the wires, electrons in the conduction band move through the wires from the positive to the negative pole through the light bulb. The electrons have an average drift velocity, carrying kinetic energy. In the wire itself they do not lose energy. In the resistance of the lamp they lose energy transferring it to the molecules of the resistor. The way electrons lose energy when decelerated is through photons, in the case of the light bulb infrared photons which make the lamp incandescent and then excite the electrons of the molecules of the resistor to high levels, enough to start deexciting in visible light photon transitions. created OUTSIDE THE WIRES into the light bulb ( or any other resistor). this is wrong. I have also read that the friction caused in the movement of electrons cause light bulb to heat up. See my description above . It is nor really friction, as friction is a macroscopic effect. It is electromagnetic interactions. Not the answer you're looking for? Browse other questions tagged electricity or ask your own question. How does electricity propagate in a conductor? Why does electrical current start to flow? How electrical energy is transfered trhough a wire, and what's flow of charge? What is electric energy since electrons are not consumed? Why does a battery die more quickly when more resistors are added to the circuit? Do electrons coming out of a lightbulb (and going back into the circuit) slow down? How does resistor affect drift velocity? Energy transfer from chemical to heat energy in resistor?